Te Papa’s Pacific Cultures staff are blogging daily to mark the annual Tongan Language Week. The theme for this year is Fakakoloa ‘o Aotearoa ‘aki ‘etau Hiva Fakatonga – Enriching Aotearoa with Tongan Music. 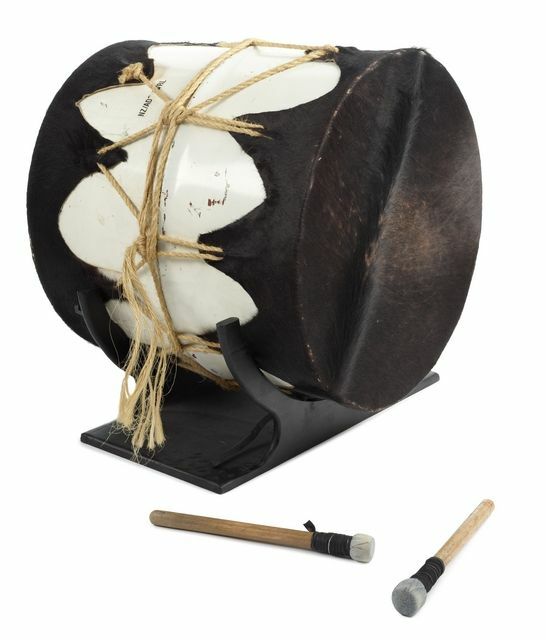 Today’s blog, by Grace Hutton (Collection Manager – Pacific Cultures) highlights examples of Tongan nafa (drums) in Te Papa’s collections. 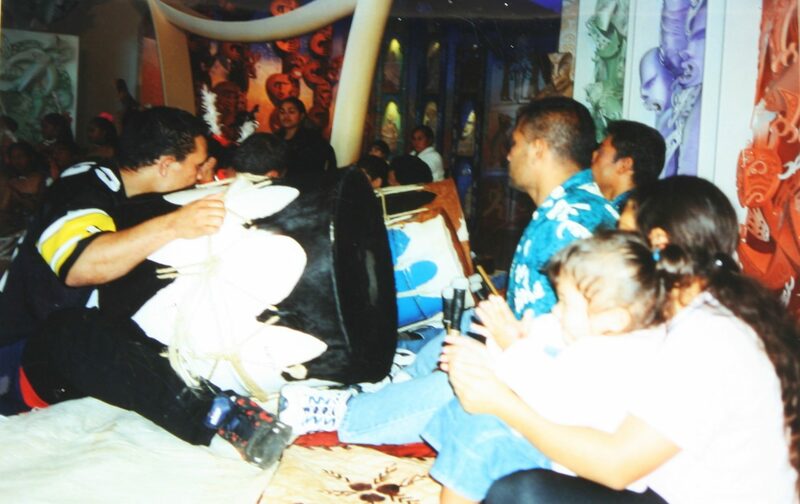 Drumming is a significant part of Pacific life and cultural performances. Drums are also played in many aspects of life in New Zealand, from sporting events, such as the games of the Warriors rugby league teams, to cultural festivals and symphony orchestra concerts. Contemporary music groups like the popular Te Vaka have incorporated different drum rhythms from diverse islands in many of the songs they perform. 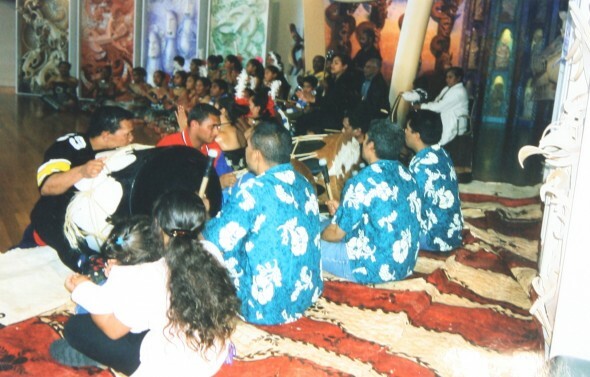 Historically in Tonga, the drum called nafa were wooden slit drums, they were cylindrical in cross section and beaten to accompany the me’elaufola (a dance no longer performed), and the me’etu’upaki a paddle club dance. The first written accounts about the nafa appear in journals written by personnel on English explorer James Cook’s visit to Tonga in 1773. 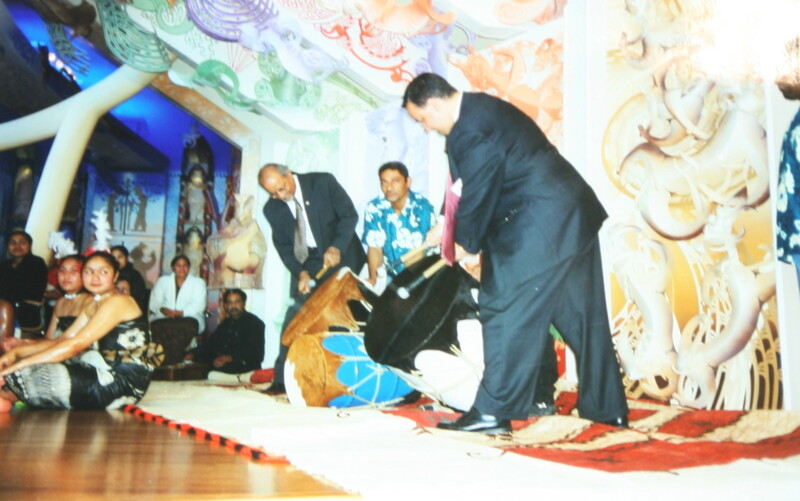 According to Pacific music scholar Richard Moyle, Tongans state that a dance called the ma`ulu`ulu was introduced from Samoa around 1900 and it is assumed that the drum appeared at the same time, and was of local invention. The introduction of cattle to Tonga in the early 1900s seems likely as the time when the drum assumed its present form, and indeed the principal value of hides still lies in their use as drumheads for the nafa (Moyle1987:80-81) .The nafa is laid with skins vertical on the ground or on wooden stands, or are held by assistants. It is beaten with two soft headed drumsticks. From one to five such drums of different sizes typically accompany the ma`ulu`ulu (Moyle1987). The set of three nafa in the Pacific collection were made by Kaveinga Lutui with help from Sione Sitani and `Inoke Lutui. They are made from old oil drums with the ends cut off and cow hide pulled taut with rope to cover the both ends. The makers had difficulty acquiring the dried cow hide so Preston’s abattoir in the Ngauranga gorge near Wellington were approached about selling dried cow hide to Te Papa for Kaveinga to use. Preston’s sent their entire stock of green cow hide to a butchery in Hastings where the hides were cured for sale. Four cow hides were purchased to make three large and one small drum. In 1999, a blessing and presentation of the drums by the makers was held on Te Marae at the Museum of New Zealand Te Papa Tongarewa. The event was accompanied with a performance of the ma`ulu`ulu by the Petone Tongan Methodist Youth Group. I was wondering if you could help me find out where I could be able to purchase drums, we are in great need of a drum for use and would greatly apprieciate your help. 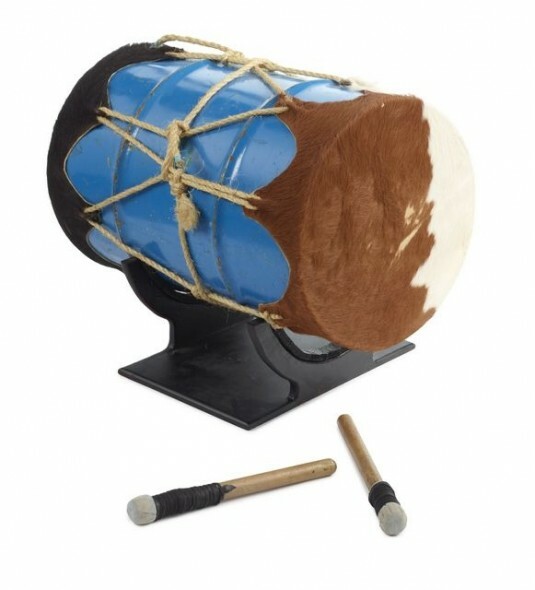 I am hoping you would be able to direct me where I can buy some Tongan drums? We are trying to purchase some for our Tongan community, her in South Auckland, cultural performances. It would be wonderful if we were able to purchase such a masterpiece! Thank you for your time team and have a lovely afternoon. 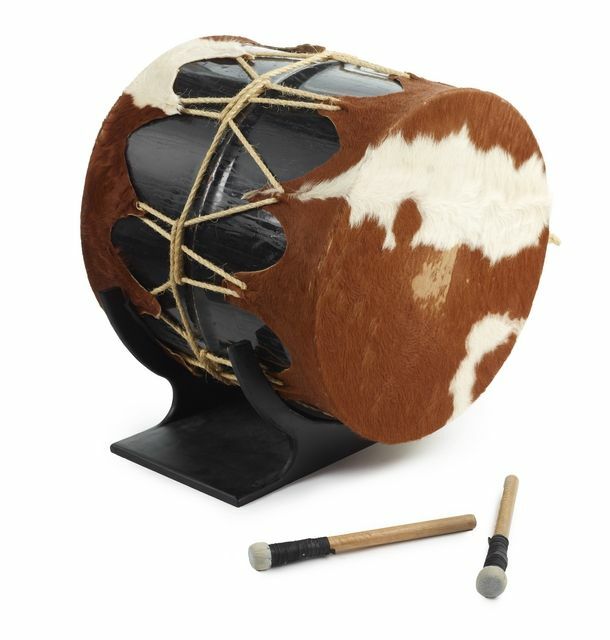 I’m writing on behalf of the Tongan Society South Canterbury to see where we could get a nafa drum from either from in Wellington or possibly closer to home in South Island? We have an opening on 27th May as want to see if we can possibly get one or two before then. We would greatly appreciate if you would provide us with any contact details for who may make them etc?? Malo i lelei Pauline, thank you for reading the blog. One of our staff will be in touch with you via e-mail about your request. Is there someone I could order drums from? Pretty urgent. Thank you. Thank you for reading the blog. I have e-mailed you with contact details for someone who may be able to assist with your request.